I was walking home from the barbershop with Kate. As usual, she was rattling off some baseball statistics. I was more focused on bouncing my tennis ball, than on her facts. That was, until she mentioned Bobby Cox. Bobby Cox was a manager for the Yankees, Blue Jays, and Braves for almost 40 years! 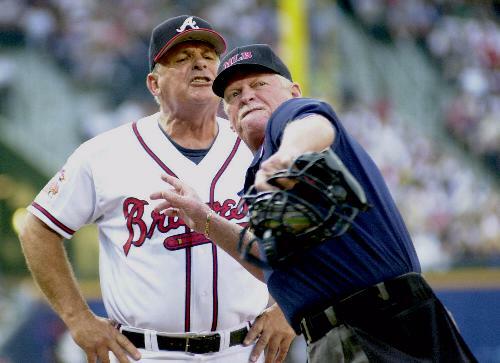 The coolest thing about Bobby Cox is that he was ejected (that means thrown out) from a record of 161 total games! He was well known for yelling, screaming, and even kicking dirt on the umpires. One time, he had to be held back so he didn’t punch the umpire. When I got home, I called up some of my friends and we went down to the ballpark to play a game. When there was a close play, I ran onto the field and did my best Bobby Cox interpretation! We weren’t able to finish the game because all of my friends kept pretending to get ejected. It was fun pretending to get into arguments, but it’s probably not that fun when you’re in a real game, having a real argument.I think I’d rather just be a really good player. Getting into arguments and getting ejected probably isn’t the best way to have fun when playing baseball. On the way home, I realized I’m just glad I never had to be an umpire when Bobby Cox’s team was playing!